Heart's Delight Cards: Is It Christmas, Yet? Some people never outgrow (or is it grow up, lol) the love of Christmas, and that's a good thing! There's just a feeling involved that is hard to describe. Is it the "goodwill toward men", or the gatherings of friends and family, or the satisfaction of finding (or making) the perfect gift for a loved one? Is it the colors, and lights, and sounds, and smells? I don't know, but I do know I'm one of those people who absolutely love the holiday season. When the sun starts slanting toward autumn and becomes more golden, and the nights start to get crisp, I can feel the anticipation building in me. I love autumn. I love Halloween. I love Thanksgiving. And I especially love Christmas! I've started thinking about my swaps for next club meeting, trying to get a head start so I'm not up until 4:00 a.m. getting them finished. It's my month to pick the theme, and I chose "any winter theme card", so Christmas seemed the logical choice and I made this card......but ya know what? I think I'm going to surprise the club members, heh heh heh. Winter runs from December until March. And that's all I'm gonna say about that. Gorgeous card. I love this card. Of course I love all your cards. oooh...I like! We must have been bit with the same "love the holidays" bug. 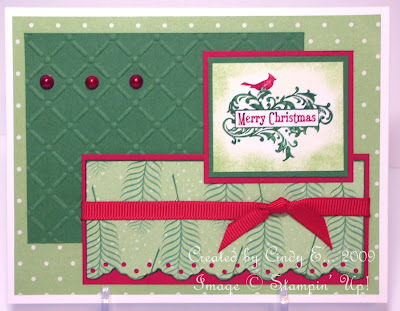 Love how you used the texturz plate on this--it add just the right amount of interest. . . .